Practically everyone believes that violence is wrong, it is evil, and it is a huge problem all around the world. We long for peace that is real, that is lasting, and that is more than just an oasis in a desert of violence. We just can’t agree on what to do about it. Nor can we agree with what the Bible says about it. Or what Jesus’ stance on it is. Since I spend so much of my time writing about and teaching the Bible, I encounter this a lot, especially since in my study, my teaching, and my writing I have become convinced that this is a major concern of Jesus himself and the Bible as a whole. Jesus confronts the world’s belief that those who conquer are those who survive the killing victorious. He makes the counter-intuitive assertion that those who conquer are those who die without lifting a sword. The cross was him living that assertion out, but it was more than that. It was God’s declaration that in this sacrificial death, the evil of “righteous” violence was exposed, it’s chains on humanity broken, and the victory over such sin achieved. The resurrection didn’t achieve the victory, it declared and vindicated the victory. The victory was in the dying. 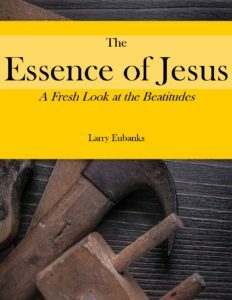 The rest of the New Testament was written to 1) show that this was what God was up to all along in the story of Israel that is embodied in the Old Testament and; 2) lay out the implications of this victory for followers of Jesus living in a world that is still addicted to violence as a means of solving problems. Even among those who can accept the above, however, there is resistance. It’s not just that it’s difficult to do or even unworkable in a world in which evil still abounds. It’s that we still see incidences in which violence prevents evil, and to not resort to it is to stand callously by while innocent people are killed, raped, and injured and the perpetrators gain power. We point to the police officers who kill a murderer before he can strike again, or a world war that was necessary to stop a fascist madman. To stand by and not use violence to protect and rescue the innocent seems every bit as evil as murder itself. This actually our chief complaint against an all-powerful, all-loving God who permits such atrocities to take place. He’s either powerful enough to stop them but not loving enough to care, or he’s loving enough but can’t do anything about it. And neither can we. If we love, and we have the power to do something about it, we must. It occurs to me that we are talking about two different things. Most of us are concerned about stopping the violence in front of us—the guy with an automatic weapon in an elementary school, the terrorist with explosives strapped to her body, the autocrat with an army and a thirst to rebuild an empire. God—and Jesus—are not unconcerned about such things, but they are concerned with the larger issue that continually gives rise to these incidents: how to stop the cycle of violence that humanity is enslaved to. “I have killed a man for wounding me, a young man for injuring me. If Cain is avenged seven times, then Lamech seventy-seven times.” So Lamech tells his wives in Genesis 4, showing that this problem is the concern of the Bible early on. And Jesus tells Peter (and all of us) that we are to forgive seventy-seven times. To solve the problem of escalating violence—from Cain’s seven-fold vengeance to Lamech’s seventy-seven-fold—takes escalating forgiveness. You can’t use violence, no matter how justified, to interrupt the cycle of violence. 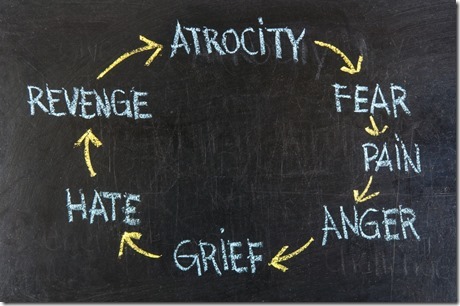 It may stop the evil in front of you, but in the end, violence can only perpetuate the cycle of violence. The only way to break a cycle is to refuse to join it. The answer to escalating violence is escalating forgiveness. This is not standing by and doing nothing; no one would accuse Jesus of doing nothing. This is confronting evil with something different. It is confronting evil with love, with life, with forgiveness. Only love can beget love; only life can beget life; only forgiveness can beget forgiveness. Is this not the Gospel? One did, and we call him Savior and Lord. We call them “witnesses” (martyrs), and Jesus says that they are the first ones to enter the kingdom of God. They are witnesses that love is greater than hate, and righteous forgiveness is more powerful than righteous retribution.